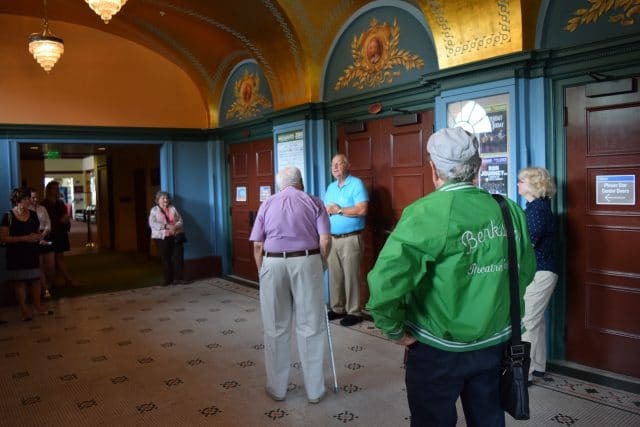 Bill Munn in the Historic Lobby conducting a Tour of The Colonial Theatre, August 4, 2018. Bill Munn is a Pittsfield native. His work and research were instrumental in helping with the Restoration of The Colonial Theatre. Today, he regularly gives historical tours for the Theatre and volunteers as an Usher. Our Archivist sat down with Bill in the Historic Lobby of The Colonial Theatre to chronicle his journey with The Colonial. How did you get involved with the Restoration of The Colonial Theatre? Interior of The Colonial Theatre during Restoration. I had been heavily involved in volunteer organizations around, and was trying to step back. So, the next year I helped with tours from Spring to Fall. They had two girls who were animated at the beginning, and they had me in the middle, and then they had Bob Boland who was very outgoing. I had the most boring part of the tour, I got to give the dimensions of everything. I decided that I loved doing research, and so I would go out and come up with one new item each week, and I wouldn’t tell anybody what it was. Eventually, I kept doing more research, and that’s how I became involved more. Interior of The Colonial Theatre as seen today. I discovered that J. B. McElfatrick was the real architect of the theatre, and that helped with a lot of fundraising because he was so historic and accomplished as a theatre architect. He designed over 200 theatres in the United States. I didn’t really know what I found at the time, I just knew that I’d found this guy who had been a theatre architect, and I was disappointed that it wasn’t the guy who designed the lobby portion of the theatre, Joseph McArthur Vance. The Friends thought it was such a big thing that they made me a vice president, and eventually I became president of the Friends. It was fun, and it was a great ride. Also in the research, Bob Boland and I went to the Pittsfield library and looked up every show that had ever played here. We have a daily calendar of everything that happened here from when it opened to when it closed. That’s actually in the Colonial Theatre book, it’s our chapter in that book. There was a lot of history. 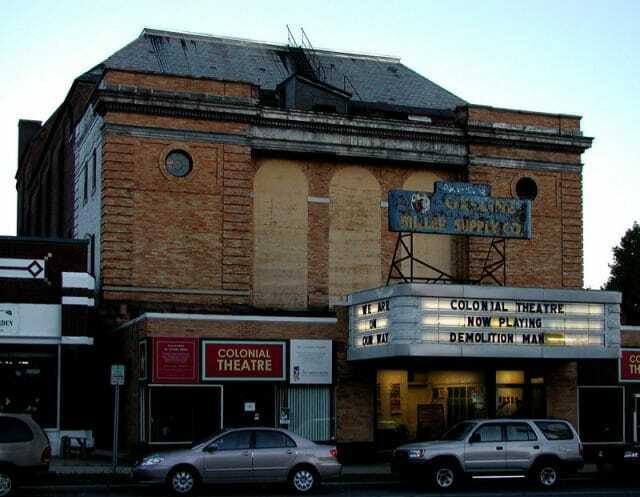 How do you remember The Colonial Theatre from your time growing up in Pittsfield? BM: I remember coming here to movies as a kid. I was like 4 or 5 years old. I remember coming in, and the popcorn stand was somewhere around here [as he points to the arch in the Historic Lobby], and I remember the seats. I remember when George Miller was here. I remember coming in here when the seats were still here, and a neighbor was looking for wallpaper. George Miller said he knew exactly where it was, what row and what seat. We actually, around 2000, were afraid that they were going to tear this place down, so we videotaped everything from the top of the house down to the bottom. We made a 45-minute tape from that, which we sold as a fundraiser. The Colonial Theatre before Restoration with marquee. What are some of your favorite facts discovered while researching The Colonial? BM: It started off kind of funny. There was a house here on this lot that belonged to a professor. The Sullivans, from North Adams, had their agent buy the property and when they went to move the house off the lot, it got caught up on the Trolley tracks out front and stopped traffic for hours! One of the most fascinating facts was that they would run a different show every night. Monday through Saturday, they’d have a different show here every night. The trains would come in with the show, the actors would go to the hotel [the Wendell, where the Berkshire Plaza Hotel sits today] and the scenery would come up here to the theatre. They’d put the show on, and then the next day they’d move on to the next town. The Colonial Theatre before it closed, presenting The Road to Yesterday. Another interesting fact is that it only took five and a half months to build the theatre. They started in April of 1903, and it was completed in September of 1903. It’s funny because the Sullivan’s were upset because it was taking too long to build The Colonial. It must have been something for the City of Pittsfield, I mean you got no TV, no radio, but you had The Colonial. When it was a movie theatre, the original projectors in 1906 used to be in the Gallery, so they were at a very steep angle. That’s when silent films were introduced. They made it over in the 1930s, and they moved the projection booth to the second floor. What is your involvement with The Colonial now? BM: Now, I answer any historic questions that people have. I also give tours, and I’m either an usher or a head usher at shows. I’ve been acting as head usher for The Colonial since before the theatre itself opened. 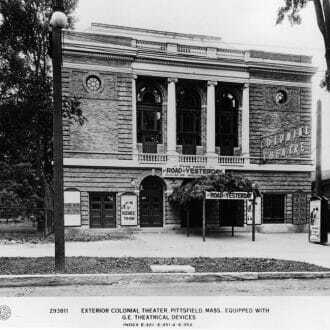 The Colonial Theatre Association used to run shows at BCC and at the Methodist Church before the Theatre was finished. One time we even did a show at Clapp Park early on. 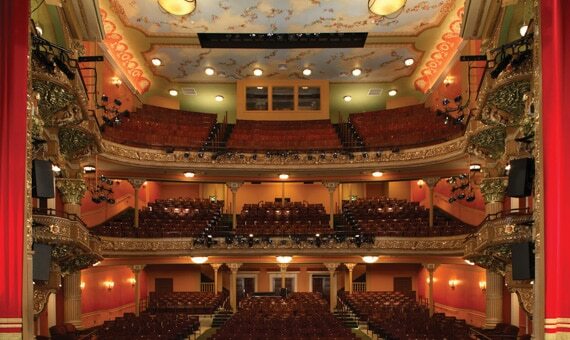 What has been your favorite show at The Colonial since it reopened? BM: Audra Mcdonald I loved. I just love listening to her sing, especially here. In The Mood was really good, it was all about the 40s and the wartime years. There’s actually been quite a few shows that I’ve enjoyed. I love the plays. Chorus Line was fantastic, you have Peter Pan, Mary Poppins. They were all well done, great plays. 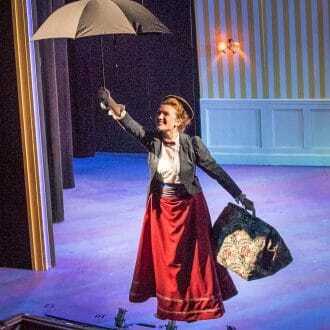 Katie Birenboim in Mary Poppins, 2015. Photo by Michelle McGrady. 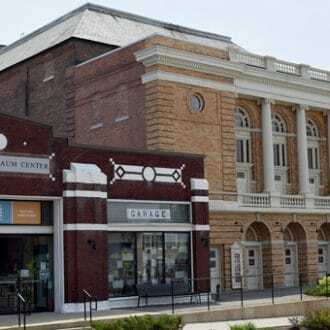 How did you feel about the merger of Berkshire Theatre Festival and The Colonial Theatre Association? BM: Berkshire Theatre Group has been doing a fine job. I think they merged the styles, I mean before The Colonial was just presenting shows, and now they’re also producing so I think that it’s the best of both worlds. I think it’s great. BM: The fact that I was here when the place was in ruins…there are nights where I come here, and no one is in the gallery, and I’ll just go up and sit there and look around. Sometimes I can’t believe that the City of Pittsfield actually had this place done over. It took two years to do it over. When it first opened, I couldn’t believe it. It looked amazing. I got to meet everyone, the architects, the construction crews, and I was here everyday and took part in making sure everything was accurate. The Colonial Theatre as seen today. Go to @massappealwwlp to hear Kate Goble (Aladdin), Lillian Colvin (Jasmine) and Travis Daly (Director) talk all things Aladdin JR.!